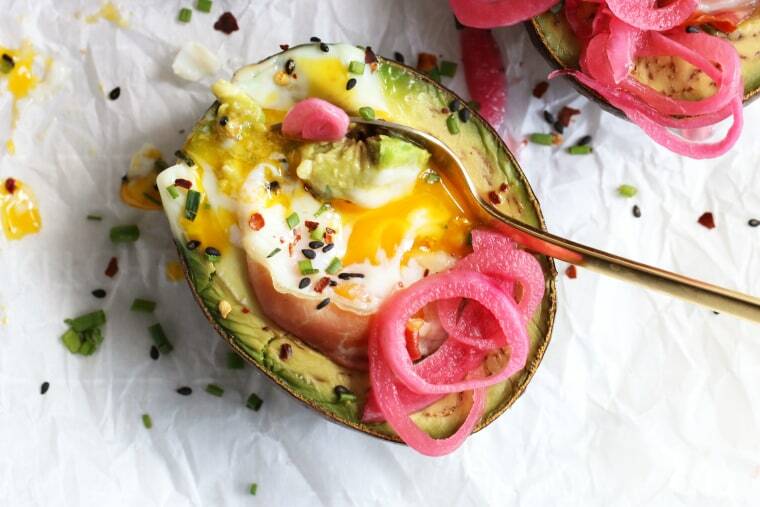 Move over avocado toast, these nutritionist-approved recipes are delicious, healthy and deserving of an Instagram post. Avocados quickly went from occasional treat at your local Mexican joint to a prized grocery store staple in a matter of a decade. Today, a quick look on Instagram and Pinterest reveals hundreds of thousands of ways to eat this green-fleshed treat. Aside from the fact that they’re rich and creamy and just plain delicious, there are some great reasons avocados belong on your menu. Here are some of avocado's top health benefits, plus some surprising new (and healthy) ways to eat them. 1. Better vitamin and mineral intake. With 20 vitamins and minerals, avocados are undoubtedly nutritious. And people who eat them have more nutritious diets that include more fruits and veggies overall, plus more fiber, vitamins E and K, magnesium, potassium, and healthy monounsaturated fat (MUFAs), according to one study. Avocado eaters also had lower intakes of added sugar. Though it’s technically considered a fruit (yes, a fruit! ), because avocados provide MUFAs and due to how they’re used in recipes and meals, I (along with many nutrition experts) describe avocados as a plant-based fat. 2. Hunger helper. Research on overweight adults found that those who ate an avocado-free lunch versus those who included about a half an avocado, avocado eaters reported more meal satisfaction and a lower desire to eat over the next five hours. Anything that helps with hunger and tastes this good is a winner in my book. 3. Weight management. Let’s clear this up once and for all. Quality, plant-based fats are good for you, even if you’re trying to lose weight. In one study on the topic, people who reported eating avocados were found to have lower BMI and body weight, and slimmer waistlines compared to non-eaters. Another study on the Mediterranean diet, which is high in MUFAs, found that even when eating an unrestricted diet (read: no calorie limits) high in MUFAs, participants lost weight and inches on their waist over a five-year period. 4. Powerful disease protection. Improvements in diet quality, reduction in added sugar intake, and better weight management are all ways to boost health in their own right. On top of that, it has been shown that avocado eaters have higher levels of HDL cholesterol (the healthy type) while separate research found that eating avocados was linked with lower levels of unhealthy LDL cholesterol, both of which benefit your heart. Research on the Mediterranean diet suggests that it may improve memory and other cognitive measures, and lower dementia rates. Other research links this dietary pattern with lower rates of depression, hearing loss, certain cancers, and type 2 diabetes. Eating MUFA-rich avocados, along with other plant-based oils (including olives and olive oil), whole grains, nuts, seeds, fruits, and veggies while reducing meat and processed foods may offer similar benefits. You already know they’re delicious — and even decadent-tasting — mashed on toast, but here are some other ways to enjoy avocados. I’ve selected a mix of sweet and savory recipes since avocados pair just as well with both. But don’t take my word for it. Try one of these avocado-based dishes and desserts and you’ll be a believer. Chocolatey dessert lovers, I stand with you. Which brings me to this epic, rich, chocolatey pudding. It has a touch of espresso powder, which brings out the deep, chocolate flavor, and unlike other avocado puddings, is sweetened with real fruit — not added sugar (whether in the form of honey, agave, maple syrup or another sweetener). Here, grilled flank steak (a lean cut of beef) is topped with chimichurri sauce. Though traditional chimichurri doesn’t call for avocado, why split hairs when you’re adding so much deliciousness and an extra dose of goodness? Registered dietitian, Kaliegh McMordie, RDN suggests you enjoy her recipe with a side of grilled sweet potatoes and a salad — great serving suggestions for rounding out your meal with veggies. Protein-rich edamame is whirled with avocado and flavorful seasonings to bring you this bright dip. Like other bean-based foods, this dip gets extra credit: Because beans are rich in nutrients, they count toward your veggie-quota as well as your protein requirements. Score extra points by using vegetable dunkers, like red pepper strips or carrot coins. Whole grain chips and crackers are healthy alternatives. This legitimately looks like dessert but it keeps things on the up-and-up for breakfast since it has no added sugar. The toppings are optional, but I’d encourage you to go light on the fruit or skip it entirely. The smoothie has plenty. Instead, you might consider a little lower-sugar granola or nuts for added crunch. I’ve had similar salads with burrata or feta cheese, but this dairy-free version gets its creaminess from avocados. Even if you love dairy, I bet you’ll appreciate this twist. You had me at brownies. Avocados and black beans are the two sneaky ingredients that put the healthy in these treats. They also happen to be dairy free and gluten free, and the recipe offers an egg free option. Avo toast, meet your match. These beauties will impress brunch guests but are also low-enough-effort for solo dining. The super simple recipe is naturally gluten free, paleo and low-carb so it’s suitable for many lifestyles. If the words “creamy” and “pasta” aren’t enough to convert you, I offer this: Dinner in 20! Plus, this pasta dish is free from gluten, dairy, eggs, nuts and grains. This version is made with edamame pasta, but to make it soy free, you could swap whole grain gluten free spaghetti (to keep it gluten free) or another bean-based variety. If you don’t need to follow a special diet, ordinary whole wheat pasta would also be a healthy choice. To satisfy a craving for mint chocolate chip ice cream in a healthier way, all you need are popsicle molds, medjool dates, avocado, mint leaves, and mint chocolate chips. For under 150 calories, you’ll have a luxurious and creamy treat. And since the recipe makes suggestions for dairy-free substitutions, you can get all this creaminess from purely plant-based sources. You might want to get a thank you note ready to fire off to the geniuses behind this simple side, snack or appetizer. The fries are both gluten free and vegan, and like many vegan dishes get lots of flavor from nutritional yeast. It’s a staple in vegan and dairy-free cooking since the savory flakes make a great swap for Parmesan cheese, among other things. If you pick up a package of nutritional yeast and are wondering what else to do with it, it’s delicious over roasted Brussels sprouts and makes a tasty popcorn topper. What if I told you that you probably have all of the ingredients and appliances you need to whip up this decadent dessert right now? This isn't fake news — it's true! Another truth: It only tastes and looks decadent. The nonfat Greek yogurt and avocado base pack in a lot of nutrition — a total bonus when it comes to dessert. If, like me, you don’t have an ice cream maker at home, don’t worry; there are directions for making it without one. The only downside to this dessert is that you have to wait for it to freeze in order to fully enjoy it. What's the healthier pick: A hot dog or a hamburger?